Nuzen Herbal Hair Oil is effective for Healthy and Natural Hair Growth. Nuzen Gold is a remedy for Hair Loss. It intensively nourishes balding scalp and stimulates hair follicles which in turn help start growing healthy hair without any side effects. Nuzen Gold is a safe, healthy & completely natural remedy to control hair loss. Promotes hair growth in 10-12 weeks. 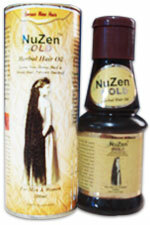 Nuzen Natural Oil prevents hair fall and grows Healthy Hair if used regularly. Nuzen Gold Herbal Hair Oil - Strengthens Hair Roots and Promotes Long Luxurious and Healthy Hair Growth. Nuzen Gold Herbal Hair Oil - 100% Ayurvedic Product. Improves blood circulation in the scalp and instanly stops hair loss. It penetrates through the cuticle and activates the dead cells and provides nourishment to hair roots. It detoxifies the blood in scalp and stimulates hair growth. Nuzen Herbal Hair Oil makes the scalp return to its natural oil production (sebum) cycle and enriches the thickness of hair. It encourages the growth of healthy, thicker and glossier hair therby bulletproofing the hair from free radicals and environmental damage. Strengthens hair roots and promotes long luxurious and healthy hair growth. Shake well before use. Take sufficient quantity of NUZEN hair oil and apply generously over the scalp and also the hair roots with finger tips. During the first week of usage head bath should be avoided. From Second week, head bath can be taken twice a week. Do not use chemical based shampoo and shikakai. Use only herbal hair cleansers. For best results apply NUZEN hair oil preferably at morning and evening. Wash your hands after every application. Keep away from children. Store at room temperature. Narikela Tailam (Coconut Oil) q.s.